Well, tomorrow will be my last post about my fantastic Jersey Big Boy tomatoes. Why, you ask? I will tell you why. I had 11 green tomatoes on the vine yesterday, waiting to ripen and to be used in my great summer tomato recipes. This morning, I have none. Yes, I said ZERO. So, you ask, who is stealing my tomatoes? A person in need of lycopene? A little neighborhood brat just having fun? No such excitement. We set up our spy camera, only to reveal that a cute, little squirrel is the culprit. I had no idea squirrels ate tomatoes! That little effer has gone to town, leaving half eaten tomatoes on the patio just to annoy me! Well, I guess I will have to move on to posts about eggplant and zucchini for the next week. I will make a zucchini olive oil cake, a pasta w/ zucchini, ricotta salata and mint, and maybe w/ the eggplant, I will make caponata (eggplant relish). I am angry about the stolen tomatoes, but I guess kharma has taken over. Remember I was the one who stole the next door neighbor's tomatoes to begin with!!!!! One year they ate the corn right off my stalks the little robbers! did your neighbor reincarnate as the squirrel? heard any strange chanting sounds from next door? AT LAST,,, CONFIRMATION OF OUR SUSPICION ABOUT THOSE NASTY LITTLE RODENTS ENJOYING OUR BIRD FOOD.. THEY ALSO LIKE TOMATOES. 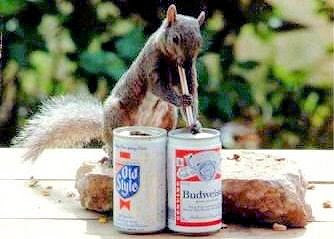 WHO TAUGHT THE SQUIRREL TO DRINK FROM A STRAW?? you nees a bb gun. sorry nothing gets between me and my tomatoes.